Serving Craft Beer & Food isn’t really that hard for a restaurant to do; attach keg, pull tap handle, pour into glass, serve next to plate. But understanding the sudsy product, its taste diversities, seasonality, categories and then pairing it along with Food that will help to accent it’s flavor, that’s a task. Beer is one of the most complex alcoholic beverages on the planet and the first one that was made not just as a luxury product. The American Craft Beer market continues to grow while breaking barriers, re-setting trends and constantly challenging the palette of the conscientious drinker. When a person like myself, a self-proclaimed Beer lover, goes out there looking to drink Craft, I don’t just want it to be available, I want it to be done right. New York City’s Little Italy has roots that trace back to the turn of the century. For centuries, especially after World War II, it served as a welcoming pad for Italian immigrants moving here. Since then it remains a Food destination, representing centuries and centuries of Italian culture. Much of it still remains despite an explosion of Italian culinary offerings around the city. One thing it’s not know for, Craft Beer & GastroPub fare…until now. 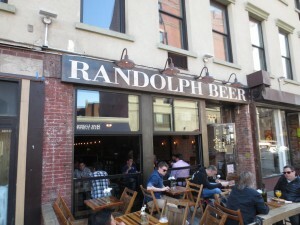 Enter Randolph Beer, a Craft Beer focused Restaurant. Their Beer menu is broken down by 6 categories: “Hop,” “Fruit & Floral,” “Tart & Funky,” “Crisp & Light,” “Rich & Sweet” and “Malt & Roast” which helps makes the product more approachable, less intimidating and easier to understand. Beers are served according to price, style, size and glassware. All of that comes along with Dinner menu with items like Fish N’ Chips, a Meatball Skillet and a Grain and Kale Salad. 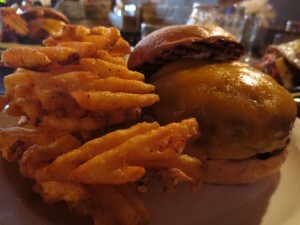 The Randolph also offers a diverse Brunch menu including a Spanish Frittata, Biscuits & Gravy and of course, a Burger. Enjoy it in their cozy Bar built from reclaimed wood or outdoors on their sidewalk patio along with live Dixie and Grassroots music. I love Breakfast. I absolutely obsess about the first meal of the day and am bewildered by people who skip it. It’s the meal with the most definable menu, which then gives one more rules to break than any other part of the culinary day. It’s also the meal of which I have largest appreciation of the palette: Grains, Eggs, Dairy, Meat, Fruits and sometimes Vegetables. I love Eggs, Bacon, Biscuits, Cheese, Sausage and Cereal. While I very infrequently am willing to get off my couch on a weekend day to go out and eat, Brunch is definitely one of my favorite style of menus. So when I sat down in front of the menu at Randolph Beer and saw Breakfast Nachos, there was almost a moment where I was not going to order a Burger. Thanks to my good buddies Bram & Russ, who suggested we split an order of them, my taste buds were not going to be denied. The Breakfast Nachos ruled. 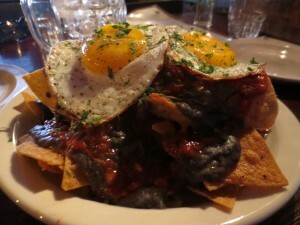 They come on fried Tortillas, with sunny side up Eggs, Black Beans, Cheese, Ranchero Sauce, baked in a skillet. The savoriness of this dish would have to be explained using charts and graphs. I definitely enjoyed washing it down with a Founders Kentucky Breakfast Stout which was like a Super Mario Brother power up to dish. Onto the Burger which is served with homemade Aioli, extra Sharp Cheddar and a side of Waffle Fries. There are all sorts of options for side Potatoes for a Burger and Randolph Beer gets points for the great choice of Waffle Fries. In my book, they’re tied for #1 with Tater Tots. Already a score for the Randolph in this review. 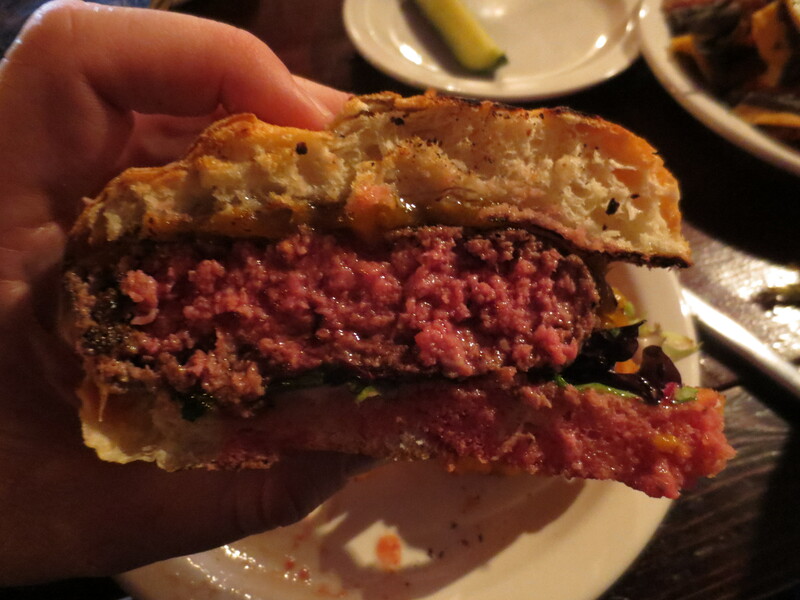 The Patty was perfectly cooked, another point and was incredibly juicy. Kudos also for a hearty Bun that tasted great and also stood up to all the oozing from the Meat. The flavors in the Beef were subtle but had a mix of Beefiness, Salt and smokiness from the char. The Ground Beef was loosely packed which helped to give it that juiciness as well as a nice soft bite. Overall, a really great Sandwich experience. If the curation of a Craft Beer menu is as important to you as the attention given to a Burger preparation, be sure to check out Randolph Beer. This entry was posted in Bar, Beer, Burgers, Gourmet Burgers, Hamburgers, New York and tagged best burger, breakfast nachos, burger conquest, cheese, ciancio, craft beer, david, french fries, hamburger, little italy, nyc, randolph, rev, review. Bookmark the permalink.